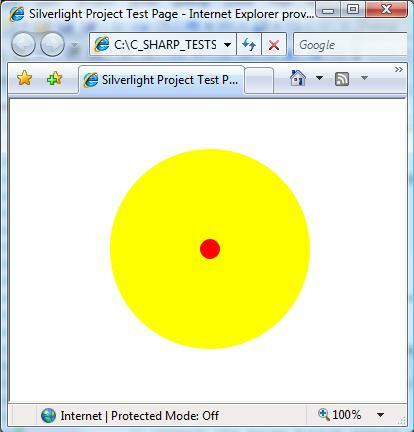 This is a continuation of a tutorial, see Silverlight 2.0 In Examples: Part 0. Introduction” and “Silverlight 2.0 In Examples: Part 1. Silverlight Elements: Panels and Controls. Since recently I’ve been working on Silverlight Drag and Drop, I decided to break the continuity of this tutorial and skip several parts, writing right away about how to implement Drag and Drop in Silverlight. In addition to information from the previous sections of the tutorial, this part requires some knowledge of DataTemplates and binding (I will give brief explanations of both). The article that started me on Silverlight 2.0 Drag and Drop can be accessed via the following link: Drag and Drop in Silverlight. At the bottom of the article you can find a link to download the source code. Here, however, I go over Drag and Drop with more details and examples. A special feature of this article is a Drag and Drop custom control designed to absorb most of the Drag and Drop complexity. Based on this control, I created an example functionally similar to the one described in Drag and Drop in Silverlight. Silverlight demos, including those corresponding to the samples presented here can be found at AWebPros Demos. 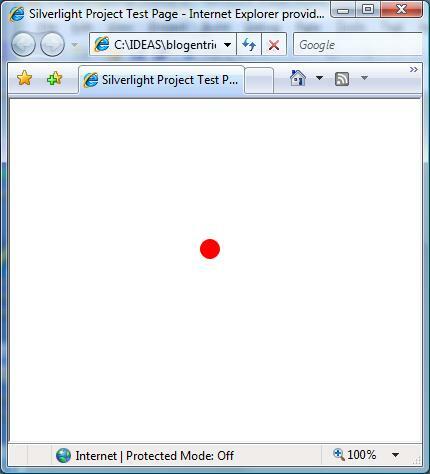 One can drag and drop the red circle anywhere within the Silverlight application area. The source code for this sample can be downloaded from simpledragdropzip.doc. As always, please remove .doc extension, rename the file to simpledragdrop.zip and then open it as a zip file. Below the code of the sample is explained in detail. The object that we are dragging and dropping is ContentControl at the very bottom of the XAML file. Its name is “MyControlToMove”. ContentControl is a control that has two major properties: Content (which contains some data) and ContentTemplate (which specifies how to present this data). In our case the presentation of MyControlToMove is not data dependent (Content property does not play any role). This presentation is determined only by the DataTemplate which is defined as a resource called “Circle” within UserControl.Resources section. In this example this ContentControl is always displayed as a red circle. Another control is used as a drag cursor to show where the circle is dragged. It is represented by a similar red circle with its opacity property set to 0.5, making it semitransparent. This control is of Popup type. Drag beginning – occurs when the left mouse button is pressed on a draggable object. Drag process – occurs when the mouse pointer is moved with the left mouse button still pressed. Drop – occurs when the left mouse button is released. All of the events are registered with the top level panel “LayoutRoot”. This is possible because of the event “Bubbling”. Even if a child of “LayoutRoot” panel is clicked, the event eventually “bubbles” up to it, unless it is handled before. Now let us describe these 3 operations in detail. Starting the drag operation is handled by the function LayoutRoot_MouseLeftButtonDown which in turn calls StartDragDrop. // start drag operation on it. First HitTest gets all the elements “pierced” by the current mouse pointer. Then we iterate over each of of the elements, find the “Ellipse” (this is our circle we want to move) and start drag operation on it by calling StartDragDrop function. // move the popup to the current mouse location. The StartDragDrop functionality is explained in the comments within its code. // we do not need to do anything. // current mouse pointer location. All we need to do is to move the Drag popup to the current location of the mouse pointer. As you can see, we stop the DragDrop operation by releasing the mouse capture, making the Drag popup invisible and setting _captured flag to false. Then we do the actual drop operation by moving the original dragged control to the new location using TranslateTransform. Now, let us consider a more complicated example. Area in which it is forbidden to drop. A special template for the Drag popup to appear when the mouse pointer is in the area in which it is forbidden to drop. The drag operation does not start right away, but only when the mouse is far enough from the origin. The yellow circle signifies the area where the drop is allowed. Outside of it, the drop is forbidden. Here is the code for the example: dragdropwithforbiddenareazip.doc. // set _captured flag to true. // if no, return false. Based on the above examples and also taking into account that the Drag popup display can be data driven (as will be shown later) I came up with a generic Drag/Drop control implementation. While it is still rather complex to use, since drag and drop is a complex operation, it also absorbs a lot of complexity into itself, eliminating the need to implement and debug a large chunk of the Drag/Drop functionality over and over again. Here is the code for generic Drag/Drop control together with a couple of samples showing how to use it: genericdragdropzip.doc. DragDrop control is defined within GenericDragDropLib project within DragDropControl.cs file. The generic.xaml file contains default control template for DragDropControl. DragDropControl contains a number of properties and events that allow customization of the Drag/Drop functionality. Here is the list of these properties and events with the explanations as to why they are needed. // its data template and date content. // it which drops are allowed, false otherwise. Below we describe two examples using DragDropControl. The solution for this test is called GenericDragDropTest.sln and it is located under GenericDragDropTest within genericdragdrop.zip file. It produces exactly the same result as our Drag/Drop with forbidden area example above, but it uses DragDropControl. Below we show how DragDropControl is used. // we only drag ellipses! Here we show an implementation of Drag/Drop analogous to that of Drag and Drop in Silverlight. The ListBoxItem objects are dragged and dropped between two ListBoxes. The code for this sample can be found under ListBoxDragDropTest directory of genericdragdrop.zip file. This sample also provides an example of having data driven visual presentation of the dragged item (the first and last names of the students provide the data that can change depending on the dragged item). // we only Drag and Drop ListBoxItem objects! One can see that the DoDrop function (called during the drop operation) checks if the target ListBox is not the same as the original ListBox from where the item was dragged and if true, removes the item from the original collection and adds it to the collection of the target ListBox. 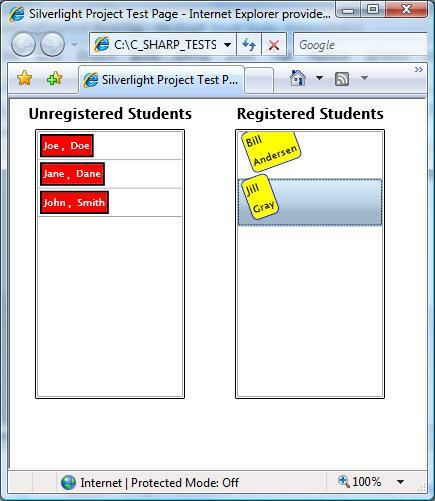 This article describes the implementation of drag and drop functionality in Silverlight. It starts with a simple example and progresses to more complex ones. It features custom DragDropControl which is used to absorb a lot of complexity of Drag/Drop implementation. You are currently browsing the Nick Polyak's Software Blog blog archives for October, 2008.